We hope you’ve been enjoying the latest issue of Crafter’s Inspiration! Even though it’s jam packed with inspiration, here’s one more from the fabulous Lynne using just some of the free gifts inside of Issue 14. Be you young or old, many would love to possess a few magical powers so this cheeky little wizard will bring a smile to anyone’s lips, but keep an eye on him as he’s sure to pop inside a book when you least expect it. Lattice edging die from Crafter’s Inspiration magazine issue 14. Using the little stars stamp, stamp the design randomly over the card to create your background “wallpaper”. Take your inks and blend layers of colours to achieve your desired look. I used pinks and purples for this card with a touch of black around the edges to give a more dramatic effect. I then coloured the stars in with Spectrum Noir Metallic pencils. Stick this to the front of your card with glue or tape. 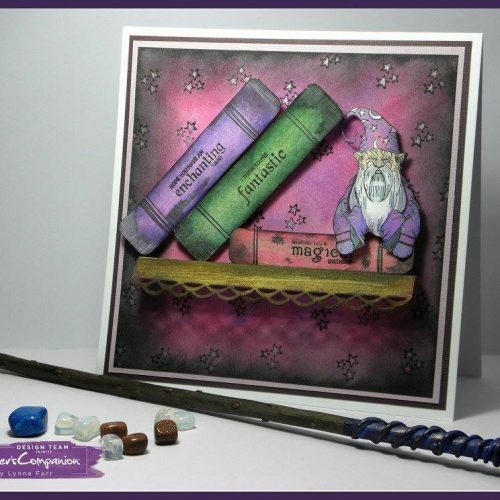 Take another piece of white stamping card and stamp your wizard image on to it. Now colour in your wizard. I used Spectrum Noir Colorista pencils for the base colours. It hen highlighted his beard, creases in his clothes and hat with the Spectrum Noir Metallic pencils. Once you have finished the wizard, carefully cut him out. Now to make the books. Cut white card into 2 strips approx. 4.5” in length and 1” wide and one 3.5” x 1”. You can round off the corners by hand but I used the corner punch which is part of the Crafter’s Companion CleverCut. Just gently offer each right angle up to the punch and press down. This cuts away the excess leaving a beautifully rounded corner. Now take your AquaBlend pencils in the colours of your choice and lightly draw over each “book”. Once you are happy with the coverage, using a very slightly damp paintbrush, blend the pencil marks together to create a colourwash. You can add more later if you require a deeper effect. Try and leave the centre of each “book” lighter in colour than the sides. This gives the illusion of the book’s spine being curved. If you find your books have an uneven lie after using the AquaBlend pencils, glue each book to another piece of card and cut out.This will add strength to your little books. At this point,I used Tim Holtz black ink to add shading to the edges of each book. I then stamped the sentiments using the stamps from the CI issue 14 magazine and once dry, highlighted the letters with Spectrum Noir Metallic pencils. Take another piece of white card and cut the width of an A4 using the die that comes with your magazine. Using your Spectrum Noir Aquablend pencils in different shades of brown, colour in about an inch of card including the die cut area. Then, using your paint brush, blend the colours together to create a wood effect. Now with the die cut edge to your left, score at ½ “ from the left side and then at 1”. Cut away the rest of the card at 2”. Before the final fix, offer the shelf up along with the books and the wizard to work out where the best place will be. Now stick the shelf to your card. Using Collall 3D glue gel, fix your “flat book” in place. Then attach your wizard making sure the sentiment on the spine of the book can still be read. Finally, attach the other two books. Using the glue gel allows time for adjusting your books into the desired position. If you haven’t picked up a copy of Crafter’s Inspiration yet, grab it here!